I’ve gotten a lot of requests to post Nori’s nursery, but we actually didn’t create one for her yet as she’s been sharing our bedroom! I love having her close by, especially during these first few months with multiple overnight feedings and diaper changes. She’s starting to outgrow her bassinet though and actually sleep through the night (! ), so we’ll have to clear out a room for her soon! Both of our parents, on the other hand, were each eager to set aside a nursery space for Nori in hopes that they can see their grandbaby more often. We spent Thanksgiving week at my parents’ home, where we have the Kendall convertible crib in the low profile option (4 inches lower than their regular crib) – finally a baby crib for petite moms! I’m 5 feet tall and my whole family is on the shorter side, so having this lower side panel (since drop-side cribs were banned for safety reasons) makes it a lot easier to lift a weighty baby in and out. There are three mattress platform settings so you can lower it as your little one grows – it’s set at the highest one in these photos. 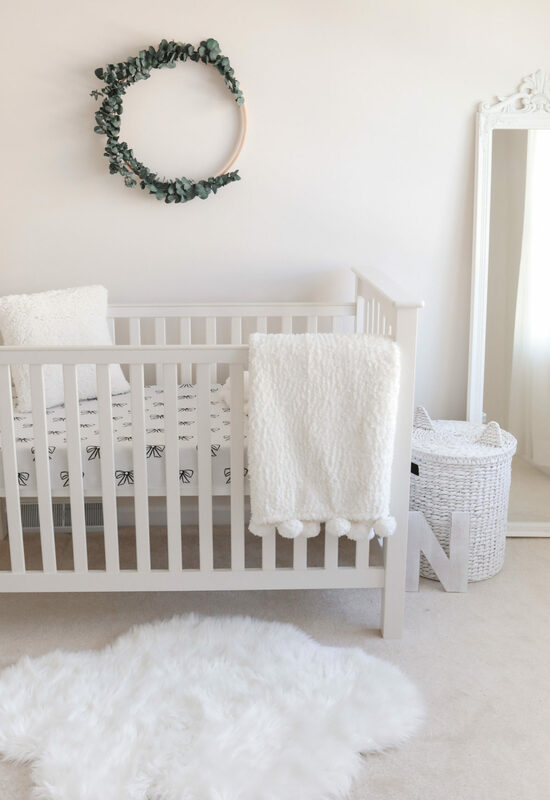 The Kendall crib can also convert to a toddler bed, and we love the beautiful solid wood quality and the protective teething guard along the top rail. See all coordinating Kendall furniture items here. I’m partnering with Pottery Barn to share their Fair Trade Certified products, which are produced in factories that ensure fair and safe labor practices. You can read more about this initiative and see all of their fair trade products here. The entire Kendall furniture collection is made in a Fair Trade Certified factory (and is Greenguard Gold certified), plus is on extra sale this weekend making the crib half off its original price! 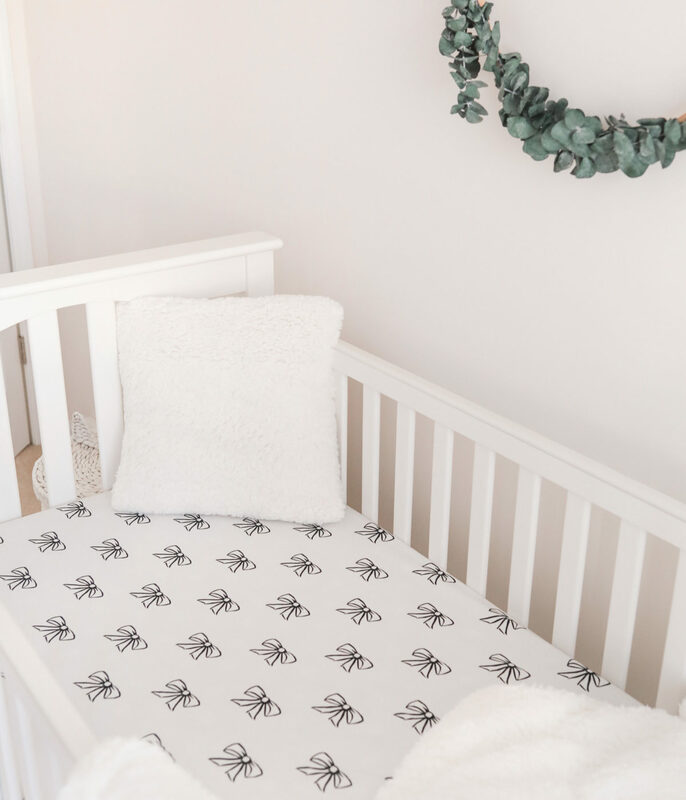 My other fair trade picks include their popular Addison rug, and this soft, organic teddy bear bedding collection with matching pajamas (all on sale). We kept this space for Nori bright and airy with just white but in a mix of textures. She loves reading with us on this fluffy rug and giggling at herself in the mirror! I added a hint of print with this darling bow sheet, and made a simple “wreath” with a quilting hoop, garden wire, and dried eucalyptus. What a beautiful space! I did a whole nursery before my baby girl arrived, but she stayed in our room for 3 months and we mostly used her room for diaper changes and snuggling in the recliner! Ooh I need to get on that PB sale! I’m due in January and still have some stuff I need to get still! Love how you decorated her nursery 🙂 That wall piece is gorgeous. Have you found a similar petite-size changing table? It didn’t look like the Kendall line had a changing table online. I am wondering what nursing chair your recommend? Not sure if you’re still in the market for a nursing chair but I looked high and low for one that accommodated my stature (I’m 4’10.5″) and I finally found the perfect one at La-Z-Boy! My femur fit fine, feet touch the ground, it swivels and reclines at 3 different settings. Buy Buy Baby has a bunch too but they don’t have as many options as the La-Z-Boy one did.